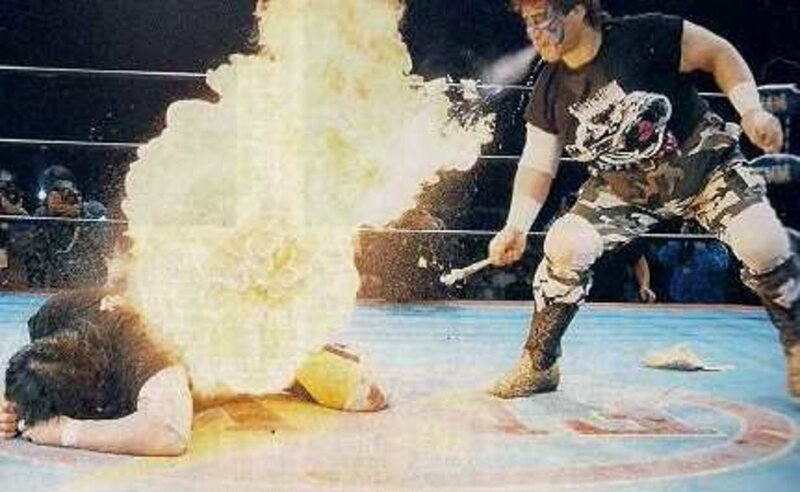 Tetsuo Sekigawa, best known as Mr. Pogo, one of the faces of death match wrestling, passed away early Friday at the age of 66. Sekigawa was undergoing back surgery at a hospital in his hometown of Gunma and his death was reported as due to a cerebral infarction during surgery. Sekigawa, who used a number of names during his career, most notably Mr. Pogo, Great Pogo, King Pogo, Mr Seki, Great Seki, Judo Joe, Ninja Warrior, and a number of others, had been a pro wrestler for 45 years. He was the varsity heavyweight at Chuo College and was a contemporary in college of Tomomi "Jumbo" Tsuruta, who became an all-time great as a pro wrestler. Tsuruta was a basketball star growing up who had never wrestled, but his dream was to compete in the Olympics. While in college, he realized that Japan would never make the Olympics in basketball in that era, and in studying sports, found wrestling interesting. He went out for the wrestling team, where Sekigawa was the star, and was mocked at first but Tsuruta picked the sport up like almost nobody in history, and within months was beating Sekigawa in practice and within a year had captured the All-Japan collegiate championship and less than two years after picking up the sport, was competing in the 1972 Olympics. Sekigawa actually turned pro first, before the 1972 Olympics. He was at first recruited by Japan Pro Wrestling, but was lured to New Japan and debuted two weeks after the formation of the promotion. He left Japan in 1973 and started a long U.S. run in Georgia as Judo Joe, doing a series of judo vs. wrestling matches against Mr. Wrestling. He also worked in Stampede Wrestling, All-Star Wrestling in Vancouver, and in California for the LeBell promotion. It was in California that he was known as Mr. Seki. He mostly wrestled at the prelim and mid-card level under a variety of names, hitting nearly every promotion in North America. By the late 1970s, he was considered a regional star. He was first given the name Mr. Pogo while working in West Texas, but he was known as Mr. Sekigawa when he captured the North American title with Stampede Wrestling, and briefly formed a tag team with a young Dynamite Kid. It wasn't until 1985 that he returned to New Japan. He and Kazuo Sakurada, also known as Kendo Nagasaki, formed a tag team called the Ninja Express in New Japan and Puerto Rico from 1985 to 1991. It was in the 90s where he became known as a death match specialist, working for FMW and W*ING, with matches against the likes of Atsushi Onita (his most famous career rival), Masato Tanaka, and Terry Funk. He suffered a broken neck in a death match with Funk in 1996 and at first it was feared his career was over as he literally couldn't move in the ring. But he returned the next year and has continued to wrestle on smaller promotion shows the past 20 years.